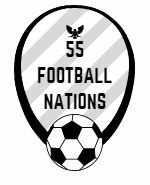 55 Football Nations was featured in a mammoth four page article by Record, the Portuguese sports daily, the weekend before 55FN matches at Porto and Vitória de Guimarães. Their mighty map included the first match from the 42 football nations up to Portugal. 55FN picked his top ten matches for different reasons. The very first match (1 – Georgia), my best journey (6 – Finland), a new friend (8 – Kazakhstan), the goalkeeper scoring (10 – Belarus) and delicious indulgence of beer sticks (best food (11 – Lithuania). A classic old stadium (14 – Northern Ireland) and crazy fans (17 – Turkey). A brilliant last-minute winner (19 – Serbia) and the best goal of 55FN (25 – Netherlands) so far. And a ridiculous chicken mascot (35 – Israel). I was pleased to be wearing a different shirt in every shot. There was even space for a Luis Boa Morte retrospective, one of my favourite Fulham players. “He was unplayable on his day. His day wasn’t every week or he wouldn’t have played for Fulham for so long. But he had grace and pace and fire” I said. As the Fulham faithful sung, “Louis Louis Bo, Louis Louis Bo, Louis Boa More”. Sorry we didn’t get your name right Luis.